Mark the week of March 4-8 on your calendar if you are in need of a haircut, pedicure, eyebrow tint or a host of other services offered by the Utah State University Eastern Cosmetology Department. 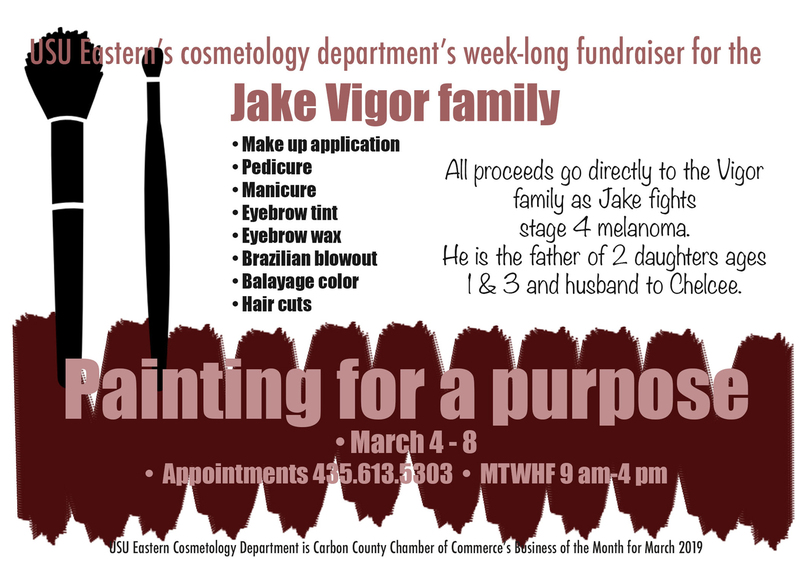 All proceeds from the first week in March, called “Painting for a Purpose,” will be donated to the Jake Vigor family. Jake is the father of two daughters: ages 1 and 3, and husband to Chelcee. He was recently diagnosed with cancer and is fighting stage-four melanoma. Eight services will be offered by the cosmetology students the week of March 4-8 including Balayage color, eyebrow wax, manicures, makeup applications, haircuts, pedicures, eyebrow tints and Brazilian blowouts as part of the fundraising specials. Every penny raised during the week will be donated to the Vigor family. To make an appointment, call 435.613.5303. The cosmetology department is open from 9 a.m. to 4 p.m. Monday through Friday for the fund raiser. Eastern’s Cosmetology Department is the Carbon County’s Chamber of Commerce Business of the Month for March 2019.